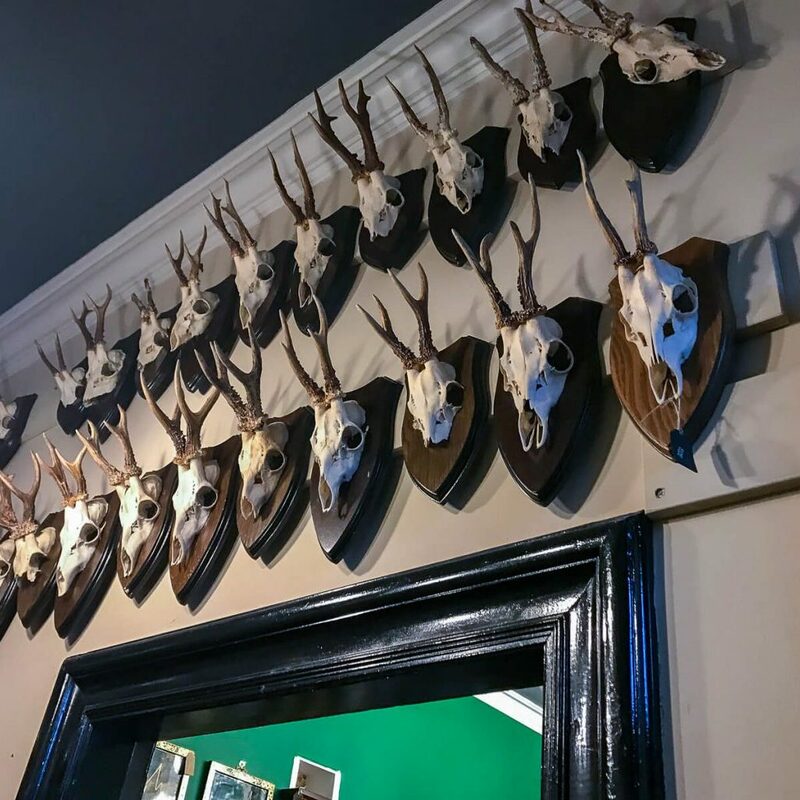 While we don’t claim to be foodies and we are certainly not food bloggers, we are however, always on the lookout for somewhere new to eat in Aberdeen and Aberdeenshire. 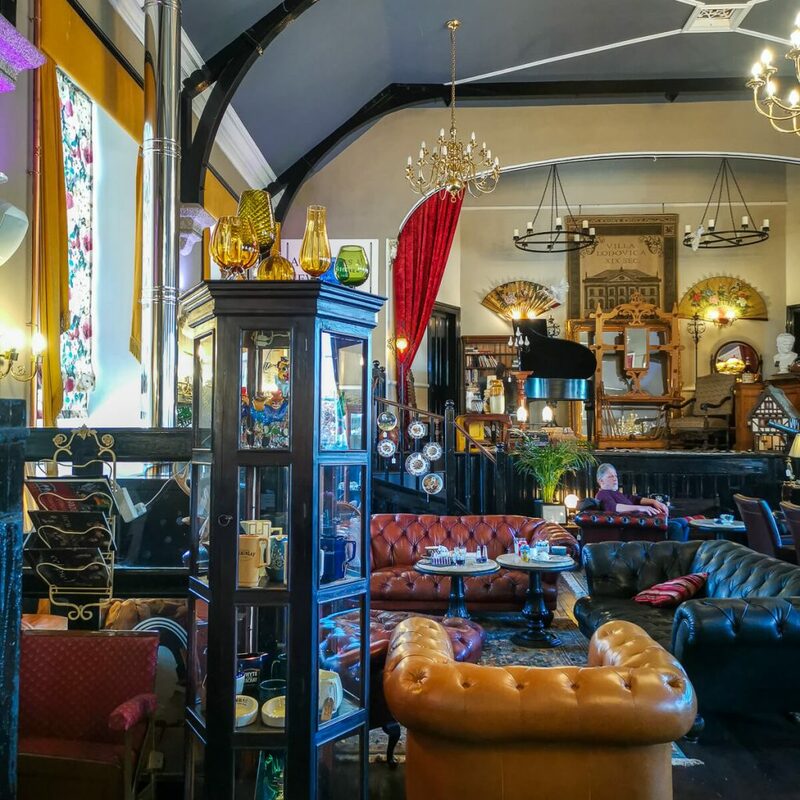 This is just something we enjoy and whether that’s for a full dining experience, afternoon tea or simply coffee and cake, we love to know what is on offer in and around the area and of course, we can then share this information with people like you, who may not have heard of these great places otherwise! Sharing is caring as they say and we are always keen to help local business’ where we can, so I’m really pleased (I’m taking full credit for this one) to have come across The Old Auction Room and Cafe 1909 in Strichen near Fraserburgh. If you know the area at all, The Old Auction Room is just across the road from the White Horse Hotel and restaurant on the High Street and with such an unassuming shop front and sign it would be easy to overlook this place, and in honesty, it would be very easy to walk or drive by without giving it a second glance but maybe that is to the pleasure of those that know about it, as once you step inside it’s really quite incredible and I haven’t experienced anything similar in Aberdeen. So ignore the aforementioned unassuming shop front and instead take a short walk down the lane to the side where you will find the entrance to The Old Auction Rooms. 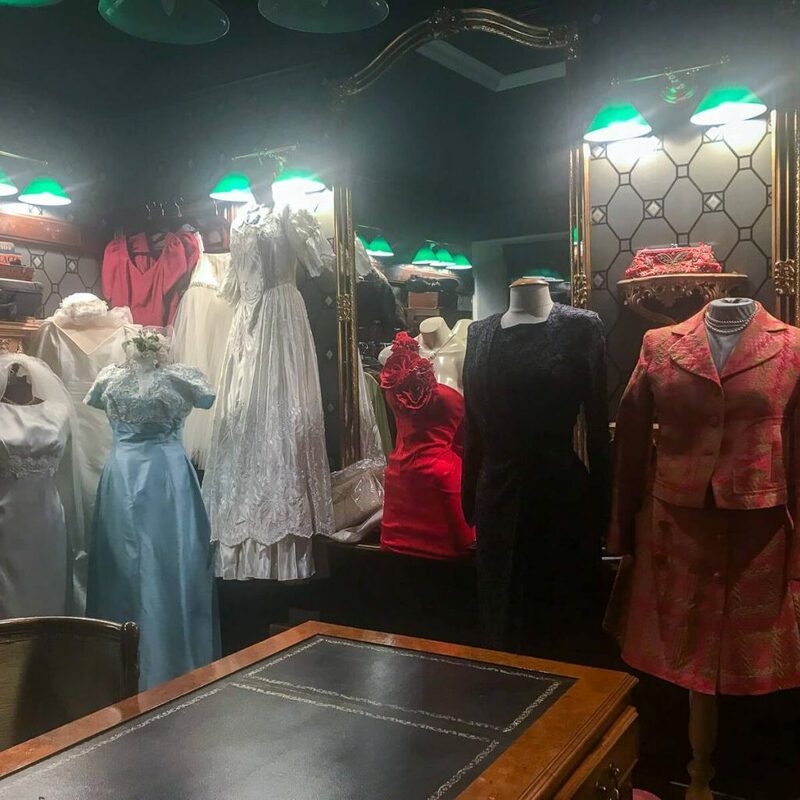 Upon entering you will see two rooms, one with Chinese/Asian influences and the other with vintage wedding dresses, military clothes, fur coats, shoes, jewellery etc. and as you continue on, you will enter the doors into Cafe 1909. Cafe 1909 is definitely somewhere to while away the hours. I can imagine it to be very popular among locals as somewhere to spend the whole afternoon and the staff certainly don’t rush anyone out of the door which makes it easy to spend a couple of hours sitting, eating, drinking and chatting. 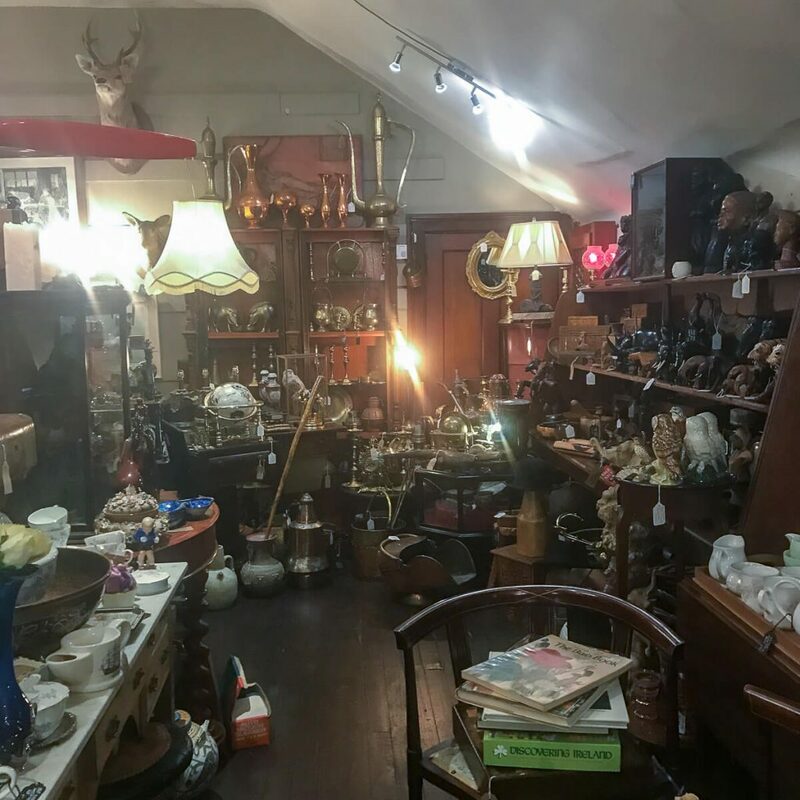 There is so much to look at all around the restaurant which you can follow further by walking through and upstairs to the shop area which sells vintage clothing, furniture, games and homeware etc. 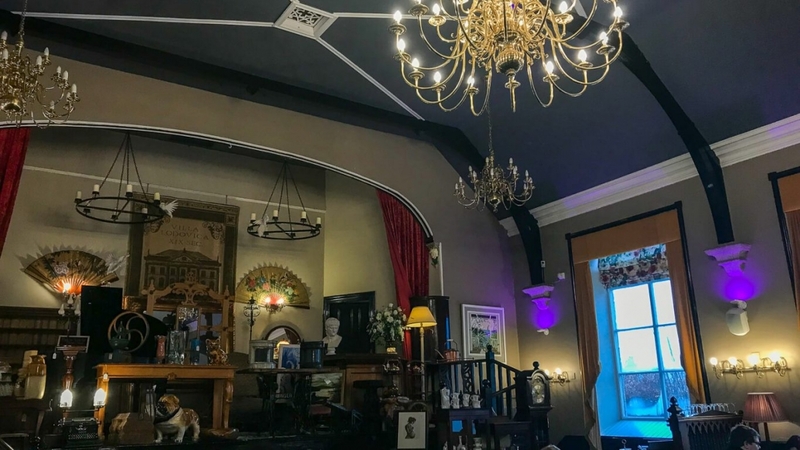 Cafe 1909 is filled with rich mustard and deep red velvet curtains, chandeliers, layered Persian style rugs, gallery walls and dark woods with antique items and artwork to admire all around you. The details have obviously been carefully considered and executed very well. It’s very eye-catching and right up my street in terms of decor. 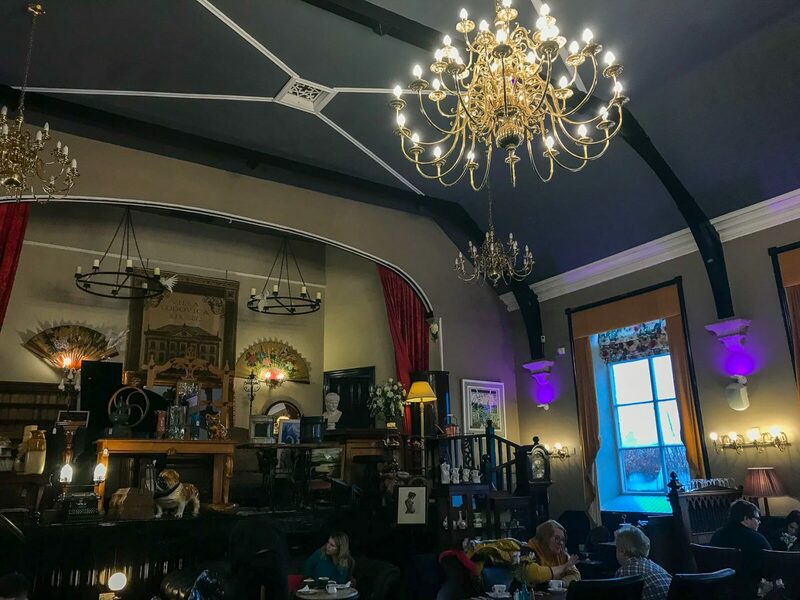 Once you get passed the restaurants initial grandeur you seat yourself at the table of your choice, or on one of the sofas by the fire if you are looking for something a little more relaxed. 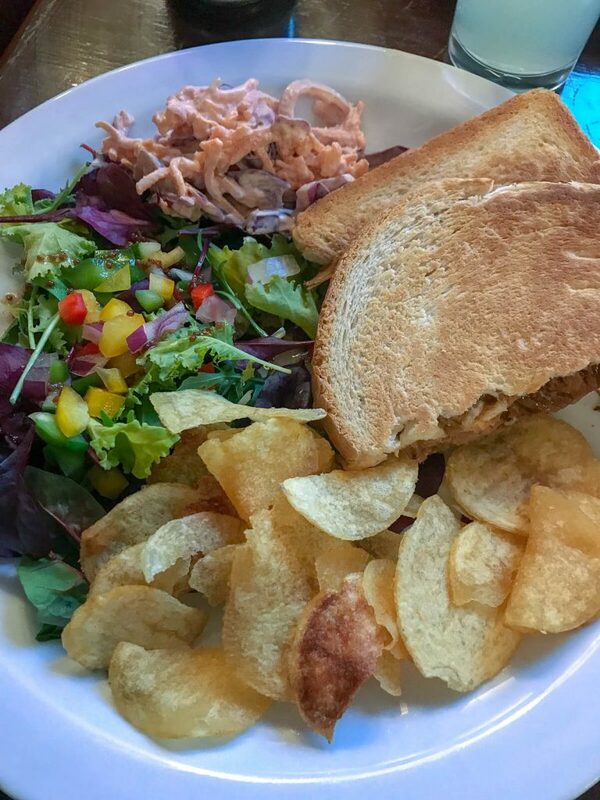 You will be provided with menus but it is well worth taking a look at the specials board by the entrance as there are always some great options listed there. 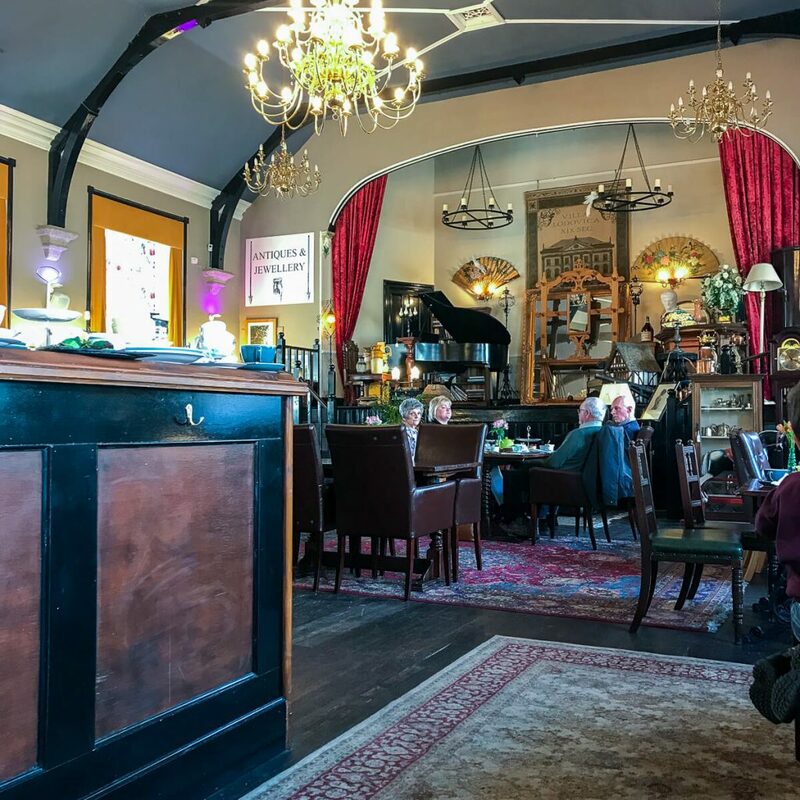 I have had the pleasure of visiting Cafe 1909 and The Old Auction Rooms twice now and made sure to choose something different on both occasions and along with the different options those I was with chose, I feel I can confidently comment on the meals that we had. On both occasions, I visited for lunch but they do offer breakfasts with the usual items, the afternoon teas have looked fantastic as they passed me and I think it’s safe to say a popular option for groups, you can also order pâté and toast which I don’t often see on menus, burgers, soups, varied options for sandwiches and often some sort of tart. 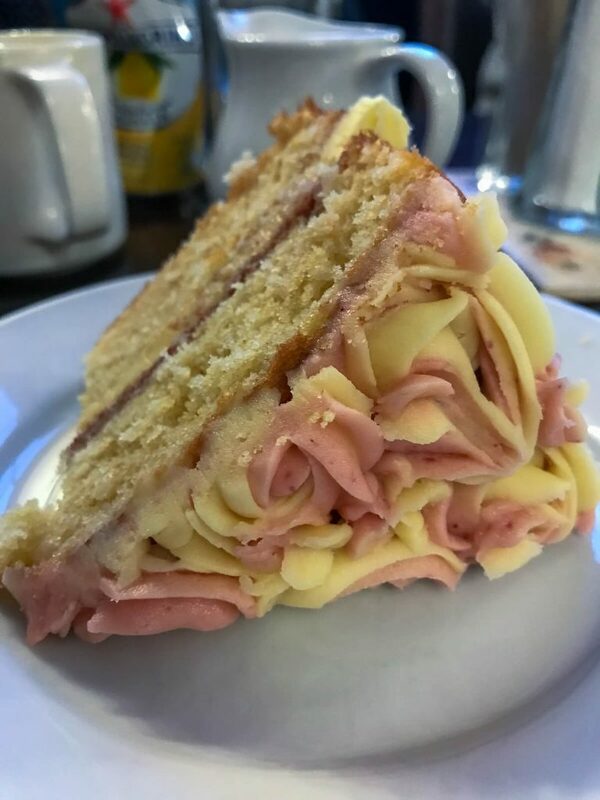 There are vegan and vegetarian options available. 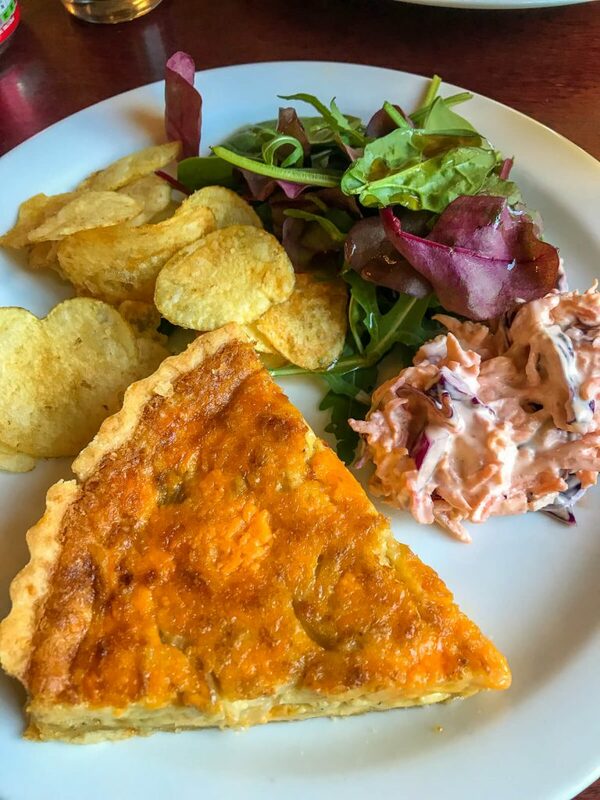 On my first visit, I had a filled ciabatta but on our last visit, I chose the cheese and onion tart with salad and crisps which was really delicious. I am not keen on cold foods that I think should be warm, which is just my personal preference but I was happy to find that it had been heated. Peter had sweet potato soup and cajun chicken panini. He thought his choice was fantastic until he tried mine. Food envy is a horrible thing! And although his was nice, I felt for him. One thing I would critique is that I had ordered a fresh apple juice but I really couldn’t class it as that, unfortunately. It was nice nonetheless, but it was a concentrate of some sort so I felt let down by the choice of wording used there. Not a big enough issue to complain about but definitely not what I had been expecting so it was a little disappointing. After finishing our meals and taking a much-needed break to chat and enjoy the atmosphere we ordered some cakes and hot drinks because I simply have too much of a sweet tooth to forego that option. 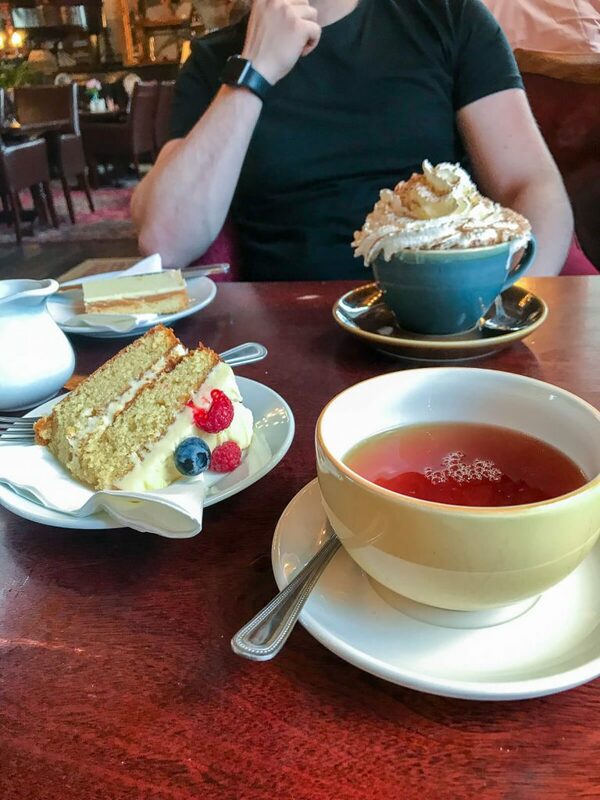 I ordered a summer fruits victoria sponge with tea while Peter ordered a white chocolate millionaire slice with a hot chocolate. Writing that back now, no wonder he couldn’t finish it! We had seen some other customers order the hot chocolate and it looked so indulgent that we couldn’t leave without trying it. Peter, of course, was the willing guinea pig. The hot chocolate came with melted marshmallows and a mountain of cream but I think he would now agree that ordering both drink and traybake was a little too much. My experience with the food served has been extremely positive. The costs are much like those we see in the city and I couldn’t begrudge it at all and the only criticism of those I visited with, is that they would have liked the option of chips but I think that’s a very minor critique in the grand scheme of things. I don’t know if it’s just a Scottish thing, everything is better with chips! 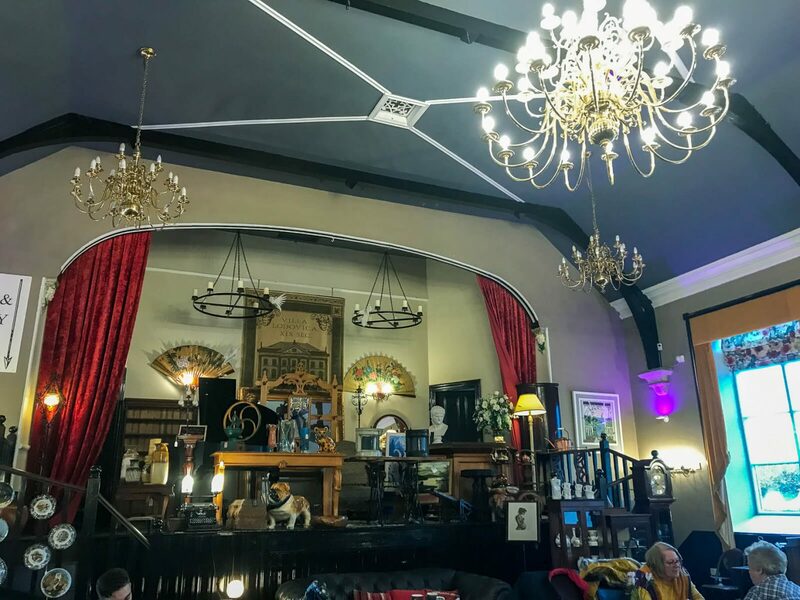 Perhaps another note of interest would be that Cafe 1909 holds events and is a venue hosting live music for bands and local artists and it is dog-friendly. It is so lovely to see all the dogs! It warms my heart. 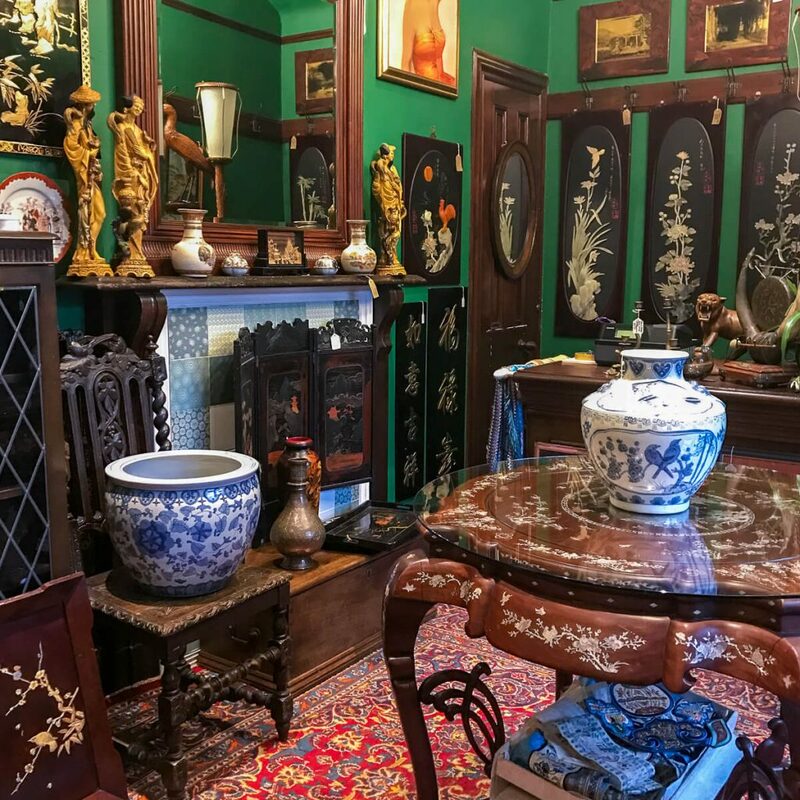 I feel like those who have a similar home aesthetic to me, those who like to mix the old with the new would love The Old Auction Room. I also think it’s a great option for alternative gifts, something a little bit different, especially for those who would maybe like original copy boardgames such as monopoly and old pharmacy style bottles for display. There are just too many items to mention so I can only recommend that you take a trip out there to see for yourself!